One of the most iconic dishes found on the busy streets of Kolkata, Ghugni chaat is a popular snack food in Bengal. 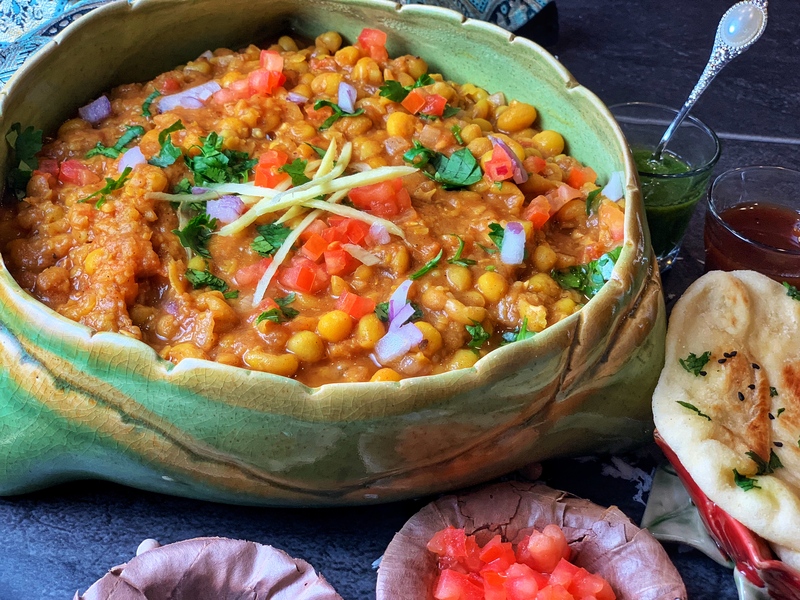 It’s made of dried white peas with chopped tomatoes, potatoes, onions, green chilies, cilantro and tamarind chutneys, ginger, and a wide variety of spices! Served with naan or as a chaat with some crunchy, tangy toppings, it’s beloved throughout the country! It’s basically a spicy curry made with dried white peas, veggies, and spices like garam masala and chaat masala. It can be prepared in a quick 25 minutes in the Instant Pot, making it a perfectly feasible option for weekdays and even parties. It’s also packed full of healthy proteins, and is oil free! Ghugni Chaat is a relished not only in Kolkata, but will soon be a favorite in your house too! Soak the dried white peas (white vatana) for 6-8 hours or ideally overnight in warm water. Drain the white peas. Put them into the Instant Pot with the potatoes, cumin seeds, cinnamon, cloves, turmeric powder, bay leaves, minced ginger and water. Make sure to add a generous pinch of salt. Lock the lid , select the manual button and set it to 15 minutes on high pressure. Make sure your vent is on the sealing position. When the cooking is complete and the Instant Pot beeps, quick release the pressure and open the lid. Discard the bay leaves, cinnamon, and cloves. Now, put the Instant Pot on sauté mode. Add tomatoes, onions, ginger julienne, and green chilies. Save a little of each for garnishing. Also lightly mash the potatoes and white peas using the back of the spoon, to release some starch and thicken the gravy. Add red chili powder, mango powder (amchur), chana masala, chaat masala, tamarind pulp, and jaggery (or sugar). Mix it all in and adjust the salt to taste. Add cilantro and sauté for 5-7 minutes and it’s ready! Garnish with cilantro and tamarind chutneys, vegetables, and masala. Squeeze some lime and Enjoy! Instead of using the Instant Pot in step 3, cook it in a pressure cooker for 2 whistle, adding 1 more cup of water. Do not over cook, do a quick release as soon as 15 minutes on manual finishes. Otherwise the peas will get mushy. Add chutneys and other spices for garnish as per your taste and preference. You can make the dish in advance - just don't add tomatoes and onions in the saute step. When you are ready to eat, mix tomatoes and onions, warm the ghugni chaat, then garnish and serve. Ghugni chaat can be enjoyed as a snack or as a curry with some bread (naan, parantha, bature or pav). You have a beautiful serving dish. Where did you buy it from can you share the link? Thank you! The serving dish is from a craft fair in Kolkata – it’s handmade. Thanks Nidhi, for inspiring the non cooks like me to try differnt recipies. I made this yesteday and everyone in the house loved it. Your presentation is amazing with very easy directions. Looking forward to trying more recipies from your blog.